Someone once asked the great evangelist Charles Finney, "Do you really believe in a literal devil?" Finney responded, "You try opposing him for a while, and you see if he's literal or not." If you want to find out if there is a literal devil, then start walking with Jesus Christ and seeking to be in the will of God. You will find just how real he is. I think that many people, after they have decided to follow Christ, are surprised to find that the Christian life can be so difficult, so intense sometimes. It isn't a life of ease, but one of conflict, warfare, and opposition. Our choice is simple: Will we be victorious? 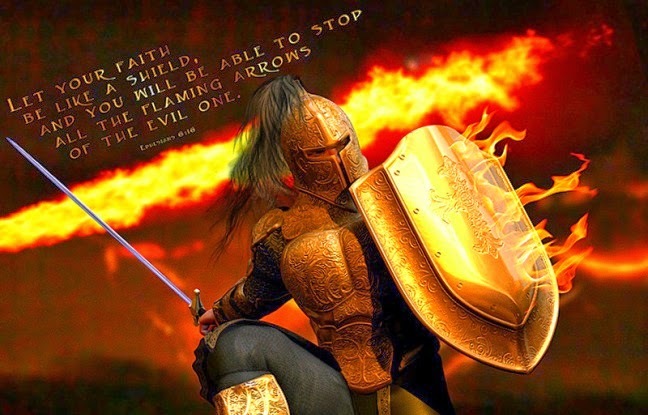 Or will we be victims on the spiritual battlefield? It has been said that you can tell a lot about a man by who his enemies are. The same is true for us. We are no longer opposing God, but we now have a new, very powerful foe, and he is described in the Bible as the Devil. The Devil, of course, is not happy with the fact that he has lost one of his own. He is angry that you have surrendered your life to Jesus Christ. Now you have become a potential threat to his kingdom as well. The closer you stay to the Lord, the safer you are, because you stand in the work that Jesus did on the cross. Don't try to engage the Devil in your own ability because he can chew you up and spit you out. But if you stand in the Lord and in His power and stay as close to Him as you can, then you will be safe. This devotional from Pastor Greg really hit home for me today and I suspect that it is true for many other Christians. As we get closer to the Rapture of the church the more intense our spiritual battles will become. Satan knows that his time is limited here and he wants to take as many people with him as he can. That is why we really need to stay in Jesus and His Word and put on the full armor of God the first thing every morning. I hope that you have a Simply Heavenly day. God bless you!! !